Last Hani´s kitten has moved: Pöyhis (Mirandos Creme de Beauty) moved to Monica´s family in Lapinkylä. We wish him all the best in his new home! :)) Lily (Mirandos Lil Miss Sunshine) will stay at home. 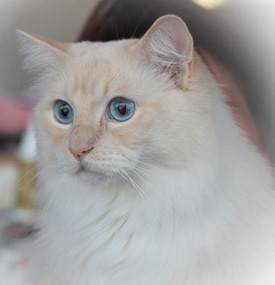 GIP Mirandos Creme de Heaven (a cream mitted) was Nominated for BIS in Turku on November 27th AND 28th, 2010! Congratulations once again to Hevi & Susanna! Mandy & Merlin´s babies were born on Wednesday night! There are 1 girl and 2 boys in the cradle. More info will come to the kitten page later on. Mandy & Merlin are expecting babies in the first week of November! You´ll find more info on the kitten page. Hani & Merlin´s babies were born yesterday afternoon! There are 4 big boys and 1 big girl in the cradle, mom and the babies are doing great. More info will come to kitten page later on. Hani & Merlin are expecting their first babies to be born in the end of September! See more info on the kitten page. I knew before that of course Merlin will be negative via his parents, but I still had to test him here because of the new rule of Suomen Kissaliitto (SRK). Last Capri´s kitten has moved: Rocky (Mirandos Dash of Black) moved to Sanna´s family in Espoo. We wish him all the best in his new home! :)) Mirandos My Angelina will be staying at home here. GIP Mirandos Creme de Heaven was Nominated for BIS in Tampere on May 15th AND 16th, 2010! Congratulations once again to Hevi & Susanna! My computer has been broken again, therefore I haven´t been able to update this site for such a long time. Thank you all who asked for Capri & Merlin´s babies and my apologizes for the old info on the kitten page. 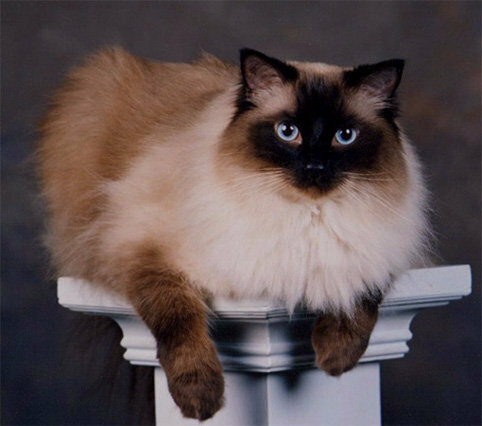 Mirandos cattery is celebrating today - I have been breeding ragdolls for 15 years already! The very first Mirandos litter was born on April 15, 1995 and there were 3 beautiful ragdolls: Mirandos Like A Song (seal bicolor female), EC Mirandos Rattle N Hum (seal colorpoint male) & EP Mirandos Joshua Tree (seal colorpoint male). Warm Congratulations to Josi (EP Mirandos Joshua Tree, photo below) who is 15 year-old today and still doing fine! Super Congratulations to Hevi for winning BIS!!! Hevi is owned by Susanna Saine. My heartfelt congratulations due to these great titles! Helsingin Sanomat, the biggest newspaper in Finland, has mentioned ragdolls again. 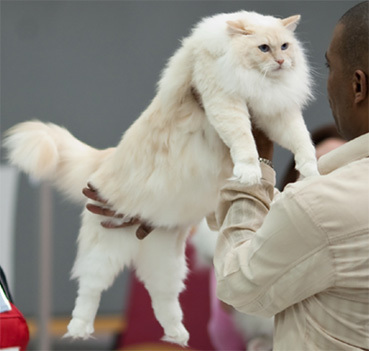 They published an article in their digital version of the newspaper and told that ragdolls were again the most popular cat breed in Finland last year. There were 769 ragdolls registered last year alone in SRK. They used Snoozie´s photo in the article, the photo was taken in 2001 when HS made a bigger story about us. The rest of Mandy´s kittens have now moved: Lilli (Mirandos Little Angel) moved to Marja´s family in Lohja and Lola (Mirandos Send Me An Angel) to Hannamari & Markku in Helsinki. We wish them all the best in their new homes! :)) Bella (Mirandos Beloved Angel) will stay here. Capri & Merlin are expecting their first babies to be born in February, week 7! This is a wonderful surprise because Merlin is still a very young male, but he sure knew what he was doing. See more info on the Kitten page. There are lots of new photos and video clips of Mandy´s babies on the Kitten page!